Castañer's iconic espadrilles were popularized in Spain in the '30s. 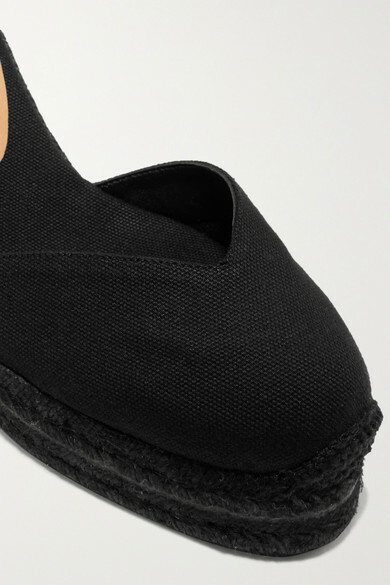 Set on a jute wedge heel, this black 'Chiara' pair is made from canvas and finished with ribbon ties that securely wrap around the ankle. Wear them on vacation with dresses and skirts. Shown here with: MATIN Dress, Cesta Collective Shoulder bag, Tohum Bracelet, Paola Vilas Ring, Sophie Buhai Earrings, WALD Berlin Necklace.